Start searching 11,124 homes in Majorca now! With various landscapes and many great activities to do, Majorca offers something for everyone with its charm and world renowned reputation for sun. Allow Holidu to assist you with finding your dream villa and start your holiday ahead of schedule. Book online with Holidu today! as well as cultural experiences in the historical town of Capdepera, dominated by a mighty fortress from the 14th century. In contrast, the island’s west is dominated by authentic mountain villages such as Valdemossa, densely forested areas and lush orchards. If you are after a more peaceful and relaxing holiday, look more towards the south of Majorca. Magical villas with pools in Campos are great for spending a relaxing time as well as properties in the picturesque fishing village of Cala Figuera with its cute harbour – original charm is still prevalent throughout the village and is perfect to experience traditional Majorca. So diverse are the destinations throughout the island, so diverse is Holidu’s offer of villas and holiday lettings. Beautiful villas, holiday lettings and holiday rentals in Majorca to relax in after a long day exploring nature are found in Alcudia and in Pollenca. You can experience summer music festivals, archaeological treasures from the Roman empire, stroll past trendy marinas by palm-lined beach promenades and soak up the sun on sandy beaches. Shoppers should venture further south to the town of Manacor, which is renowned for its pearl industry. 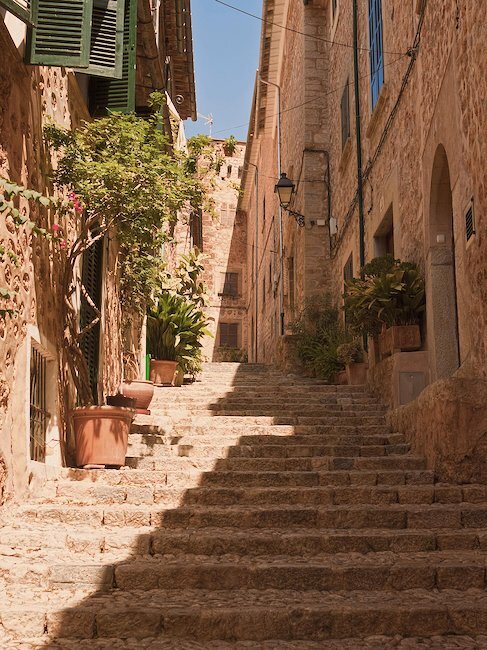 With mild winters and hot summers, Majorca is a great destination to travel to all year round – if you aim to book a villa in Majorca’s hottest period, it is advisable to look for dates around August. Average high temperatures regularly reach above 30 degrees Celsius, a great time to escape famously duller summers of northern Europe. Majorca provides many great activities all year round for various holiday makers – walking and climbing in the Serra de Tramuntana mountains, a variety of water sports on offer around the coast and the stunning city of Palma de Majorca with its museums and beautiful architecture: Majorca caters for everyone. 1. Those with a taste for fine cuisine should head to the Middle of Majorca. The peaceful and fertile land is defined as Majorca’s bread basket due to its scenic beauty and meaning for the island – a truly charming and mysteriously beautiful part. Great villas and holiday lettings with pools to relax in are found here amongst the endless almond and olive orchards which define the landscape. 2. When the landscape of Majorca glows white and pink between the middle of January until February, it is a sign of the almond blossoming season. The superb sea of blossoms marks the start of spring and spreads a gorgeous aroma. The blossoming is especially great to discover with a tour from Can Pastilla to Porto Cristo – a spectacular panoramic view of almond blossoms worth mentioning is also found at Selva. Book a wonderful villa here to experience this phenomenon! 3. Majorca also has something to offer underground: The most beautiful limestone caves found on earth are located here. The Cuevas d’Arta near Artà are especially worth mentioning – they are characterised by their stone columns, shaped from centuries of history. Temperatures are at a constant 18 degrees Celsius all year round in these gigantic holes which formerly served as places to hide for pirates. 4. A nostalgic travel experience is the journey from Palma to Sóller with the historic narrow gauge railway, known as the red lightning. At a gentle pace, the locomotive chugs along the around 20mile long route through the beautiful surroundings. Enjoy the special ambience in the vintage carriages with their authentic wooden benches, leather seats and sliding windows. 5. The monastry of Sant Salvador is found close to Felanitx. High on a hill, the decorative compound is found and offers a spectacular view of a large part of the island. The isolated “Picot” stone cross on a steep hill, the fountain in the courtyard as well as a statue of the Virgin Mary behind the altar are special monuments that aren’t sights to be missed. Book your dream Villa in Majorca today with Holidu! child friendly facilities and places to go in the area, Internet access and many more features. 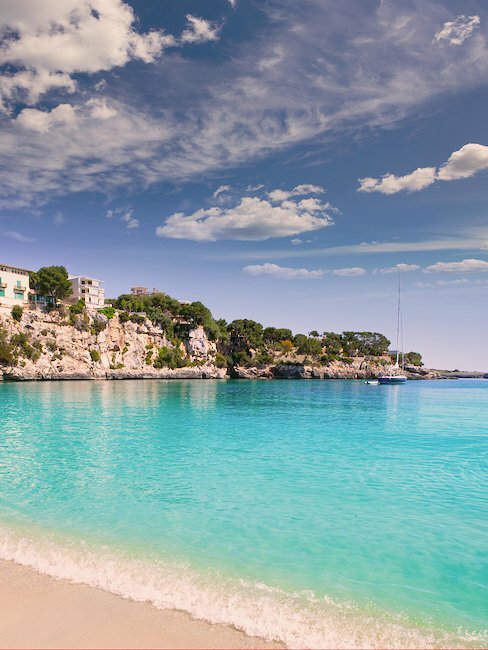 Rediscover yourself in one of Majorca’s various great locations – whether you prefer a relaxing beach break or a secluded getaway in the mountains: Majorca certainly delivers. Book your dream villa in Majorca today!